No matter how hard you try, keeping your home in pristine condition is near impossible. Once a home is 'lived in' wear and tear is a given. But while you're living in it, the condition of your property is easy to miss. It's only when you come to sell it that you realise it needs fixing and cleaning up. But where do you start, what should you repair and what can be left alone? A lick of fresh paint won't break the bank but will make a huge difference to your home's appeal. You might not even need to do every room. 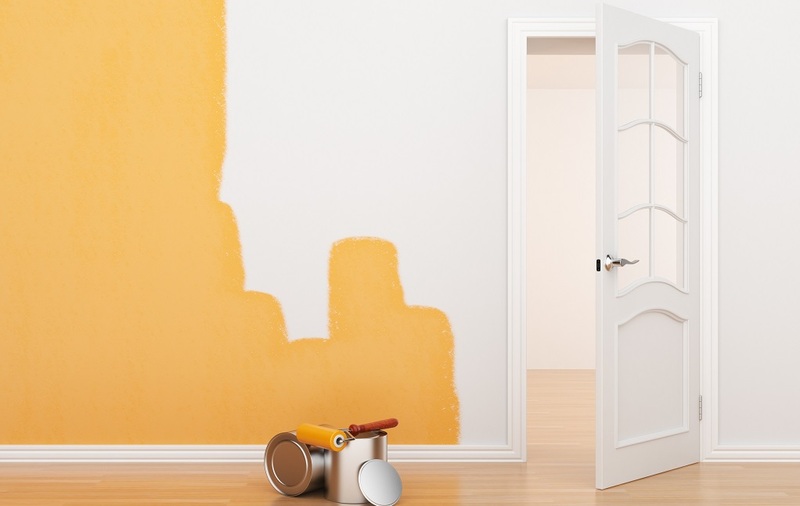 Take a look around and decide which walls need painting and which ones you can leave. And remember, keep the tones neutral and the shades light. If you have rooms with dark paint on the walls, even if it had only recently been done, give it a coat of a lighter colour. Your taste might not be the same as potential buyers, so placing your property in a 'neutral' state will help viewers see how they could make the property their own. And when it comes to wallpaper, it's best to remove it. Buyers struggle to look past wallpaper so removing it and covering with a fresh coat of paint is a must prior to the 'For Sale' board going up. What's the first thing potential buyers see? That's right, the outside of your home when they arrive for a viewing. You want it to look good and make a positive first impression. Replace any damaged or rotting fence panels and clean up the driveway with a jet wash. If you have a front lawn, make sure it is freshly mowed if you are selling during the warmer months and try to ensure any weeds are kept at bay. Some new flowers in the beds can also add to a property's homely feel. If your home is rendered on the exterior, this can get dirty and green over time so consider a jet wash or fresh lick of exterior paint. Call in a window cleaner and have your gutters, fascias and soffits cleaned. If your property is older, take a look at the brick pointing. If it needs repair work, consider it as crisp pointing makes a huge difference to a property's exterior. Almost everyone these days wants a large, spacious kitchen / diner. For many buyers, it's the 'must have' part of their wish list. Not all homes are set up for such a space and not all sellers want to spend big on a renovation, but that doesn't mean a few tweaks and changes can give your kitchen the wow factor. Unless you are certain to make your money back on the sale of your home, a kitchen renovation is probably not the way to go. Fresh paint, new tiling or a modern splash-back can all add some life to your kitchen and are reasonably cost-effective. Consider new fixtures and fittings, flooring and, with a slightly bigger spend, a new work-top. Your kitchen will look like new in no time. However, buyers will have a keen eye on the condition of appliances, so if your oven and hob have seen better days, it might be better to replace them with shiny new goods. A clean bathroom where everything works is a must for selling your home. Toilets than run on or taps that drip or leak will all set the alarm bells ringing with potential buyers, as will stained grout and cracked tiles. Bathrooms for the modern buyer are places of luxury where they can unwind, so if yours looks dated and dirty, get working on it. Draft in a plumber if you have drippy taps or running toilets and clean up your titles and grout. If they are beyond cleaning, consider new titles or replacement grout. Clean, crisp grout can make a huge difference. Paint any walls white - the lighter you can make the bathroom, the better. As with the kitchen, only consider a complete bathroom upgrade if you are certain you will make your money back from the sale. The first thing buyers will make an assessment on when they walk into your home is on the light. A dark, dank room carries no appeal, so even if your home is lacking in natural light, being clever with electric lighting can make a big difference. Take some time to look around your home's space in different natural light conditions and consider what lighting you need to bring it to life. A small spend here could pay big dividends. Any dated light fittings should be replaced and heavy curtains pulled back before viewings to allow as much natural light into the property as possible. Buyers have a habit, and you can't blame them, of opening doors and turning on taps when viewing a home. It's natural to want to know if everything works as it should, after all. So, before you put your home on the market, go around and make sure everything works as it should. Try all the door handles, open all the kitchen units and cupboards, open and close the windows and try the garage door. Anything that creaks or doesn't perform how it should, either replace it or get it fixed. Buyers will often have gas and electrical checks done as part of the transaction process. If you suspect your heating or electric systems might be in need of a little TLC, it can be better to get them assessed yourself prior to selling rather than risk slowing up the sales process further down the line. Have the boiler serviced and the wiring and fuse box checked. If there are any major issues, it's better to know early on than to find out later and watch your sale fall through. If you have any questions or concerns about selling your home, speak to your local Martin & Co office who will be happy to help.